Hydrogen (H2) is a clean and renewable energy carrier and is considered to be an ideal candidate for future mobile and stationary applications. Large-scale use requires safe and efficient storage and release of H2, however, and this remains a challenge despite investigation into multiple systems of hydrogen storage. In recent years, some research has focused on boron-nitrogen-based (B-N) hydride compounds because they are able to store and release significant quantities of H2. Of the compounds, the simplest, ammonia borane (AB), is particularly promising because it does not suffer from self-hydrolysis in water, it has a high H2 content, low molecular weight, is non-toxic and has particularly high stability in both aqueous solutions and air—it has great potential for on-board applications in transportation. Hydrolysis at room temperature has proven to be the most benign and efficient method of releasing hydrogen from AB preventing the use of elevated temperatures or any other toxic and expensive solvents. A catalyst is often needed however to drive the hydrolysis of AB. And while a range of catalysts capable of releasing hydrogen efficiently from AB exist, they suffer from a number of disadvantages. Those based on noble metals are expensive, non-sustainable, and impracticable for large-scale applications. Non-noble-metal catalysts are air sensitive and can be easily oxidized and so require special handling and storage, and can be difficult to regenerate. On top of it, catalytic activity is partially decreased or even completely disabled after few cycles of the reaction, as, for example, in the case of earth-abundant transition metals. These drawbacks motivated the researchers, led by Dr. Kyriakos C. Stylianou of EPFL and NCCR MARVEL, to try to find better catalysts. Ideal candidates should be based on abundant elements, air stable, and easily regenerated, stored and handled. Of all these strong points, the researchers considered regeneration, or self-healing—the ability of the catalyst to spontaneously repair itself during normal operations—to be the most attractive. Indeed, it's critical for practical applications because the catalyst's stability is directly linked to its economic viability. 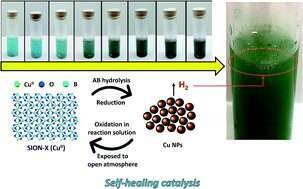 Their novel, self-healing sustainable catalyst, described in the paper Discovery of a Self-healing Catalyst for the Hydrolytic Dehydrogenation of Ammonia Borane, seems to fit the bill. The catalyst, dubbed SION-X, is the synthetic form of the Jacquesdietrichite (Cu2[(BO)(OH) 2](OH)3), a mineral first found in the Tachgagalt mine in Morocco in 1999. The scientists first obtained it as a blue powder after exposing the residue of the reaction between a copper-based metal-organic framework (MOF) and AB to open air. When they used SION-X in the hydrolysis of AB, they obtained more than 90% conversion of H2 in about 45 minutes. During the process, it transformed to copper(0) nanoparticles. When the reaction mixture was then exposed to air, the blue powder of SION-X was self-healed and reformed from copper(0) nanoparticles. They were able to perform 10 cycles of catalysis-regeneration with the activity of SION-X remaining unchanged. This self-healing process, in which the catalyst restored its structural integrity in open air without applying heat, pressure or electrical bias, is hugely important for prolonging the lifetime of the catalyst and makes SION-X a good candidate for use in large-scale hydrolytic dehydrogenation of AB. "The self-healing catalysis of SION-X in the absence of any extra energy input gives a new perspective in heterogeneous catalysis for energy-related applications," the researchers said.